I was speaking to a man this morning who has struggled for years to find and talk to women he finds attractive. I asked him what specifically tended to happen when he saw those women. In short, he psychs himself out and never ends up approaching her at all. I work with a lot of single men, helping them through these frustrating and repetitive issues (many of which have been going on their entire lives) so they can openly and easily attract a woman that really loves them for them. And for most of them, this is really what they want – that real, substantial companionship, acceptance and emotional support that comes with a really good, lasting relationship. But if there are beliefs bouncing around your head that nobody wants you or that you’re not good enough, you can bet that that will keep you single. Even if you do manage to get the nerve up to go talk to someone you REALLY want, that deep insecurity will show through and she’ll feel it, because it’s lurking in your subconscious – unfortunately there’s no hiding what you really believe. But although there’s no fixing this while the belief remains, there IS a way to address that belief directly and solve the problem. PERMANENTLY. I help people do this every day. 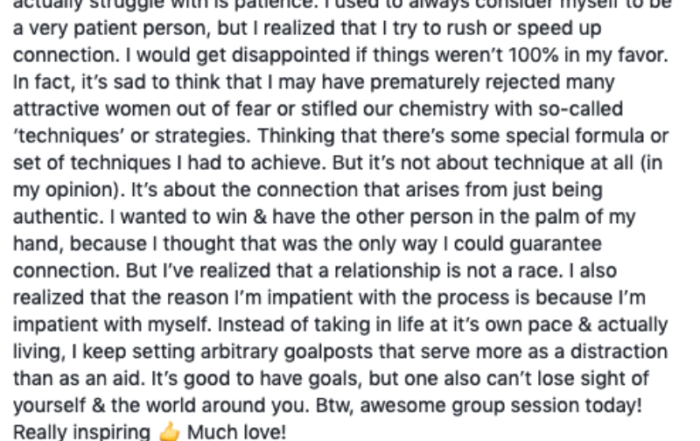 So if this sounds like you and you’re tired of the anxiety, the frustration, and the “stuck-ness” of your dating life, feel free to reach out and schedule a time to get on the phone with me, and let’s see if I can help. It’s completely free, and at the very least you’ll spend an hour or so getting insight on what the problem might be and you’ll be more informed, more clear, and more confident about your ability to fix this difficult issue. The relationship you want is right on the other side of your fears. By Dominey Drew|2019-04-11T11:24:47-04:00April 11th, 2019|Comments Off on How Josh went from crippling anxiety to wildly attractive in just 4 weeks! By Dominey Drew|2019-04-01T14:09:38-04:00April 1st, 2019|Comments Off on Is Loneliness Keeping You Single?? By Dominey Drew|2019-03-26T13:56:19-04:00March 26th, 2019|Comments Off on Do Nice Guys REALLY Finish Last? By Dominey Drew|2019-03-18T14:49:09-04:00March 11th, 2019|Comments Off on Are you waiting for a woman, to be happy? By Dominey Drew|2019-03-18T13:58:49-04:00February 28th, 2019|Comments Off on How Is Impatience Keeping You Single? Self Responsibility is the Key to Self Mastery. Self Mastery is the Key to Relationship Mastery.